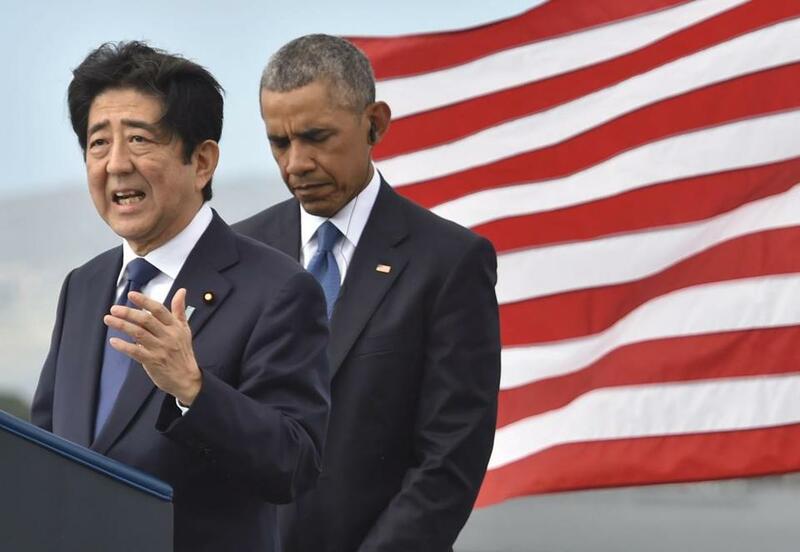 President Obama and Japanese Prime Minister Shinzo Abe participated in a ceremony at the USS Arizona Memorial. Seventy-five years after Japan’s surprise attack sent America marching into World War II, Abe and President Obama peered down at the rusting wreckage of the USS Arizona, clearly visible in the tranquil, teal water. More than 1,000 US war dead remain entombed in the submerged ship, and in a show of respect, Obama and Abe dropped purple petals into the water and stood in silence. ‘‘As the prime minister of Japan, I offer my sincere and everlasting condolences to the souls of those who lost their lives here, as well as to the spirits of all the brave men and women whose lives were taken by a war that commenced in this very place,’’ Abe said later at nearby Joint Base Pearl Harbor-Hickam. That was the closest Abe would get to an apology for the attack. And it was enough for Obama, who also declined to apologize seven months ago when he became America’s first sitting president to visit Hiroshima, where the US dropped an atomic bomb in a bid to end the war. ‘‘They were doing what they were supposed to do, and we were doing what we were supposed to do,’’ Rodrigues said before the visit. Abe, who became Japan’s first leader to visit Pearl Harbor with a US president, said the visit ‘‘brought utter silence to me.’’ His remarks capped a day that was carefully choreographed by the US and Japan to show a strong and growing alliance between former foes. Obama, speaking after he and Abe laid green-and-peach wreaths at the memorial, called the harbor a sacred place and said that ‘‘even the deepest wounds of war can give way to friendship and lasting peace.’’ It’s a notion Obama tried throughout his presidency to put into practice, as he reached out to former adversaries Iran, Myanmar and Cuba. ‘‘As we lay a wreath or toss flowers into waters that still weep, we think of the more than 2,400 American patriots, fathers and husbands, wives and daughters, manning heaven’s rails for all eternity,’’ Obama said. 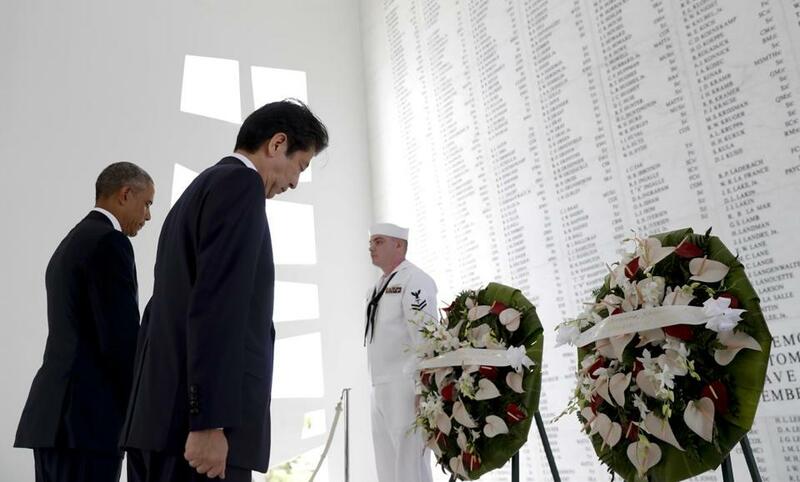 Abe spoke during his visit to the memorial at Pearl Harbor. In the years after Pearl Harbor, the US incarcerated roughly 120,000 Japanese-Americans in internment camps before dropping atomic bombs in 1945 that killed some 140,000 people in Hiroshima and 70,000 in Nagasaki. Since the war, the US and Japan have built a powerful alliance that both sides say has grown during Obama’s tenure, including strengthened military ties. Yet there are questions about whether the relationship will degenerate under President-elect Donald Trump, a possibility neither Obama nor Abe addressed.